Christina Truong: The mystery of the Mystery Brand is a mystery no more. The mystery of the Mystery Brand is a mystery no more. Tada! If you guessed Garnier, like myself, ding ding ding! You got it right! A bright orange package sure made me happy. 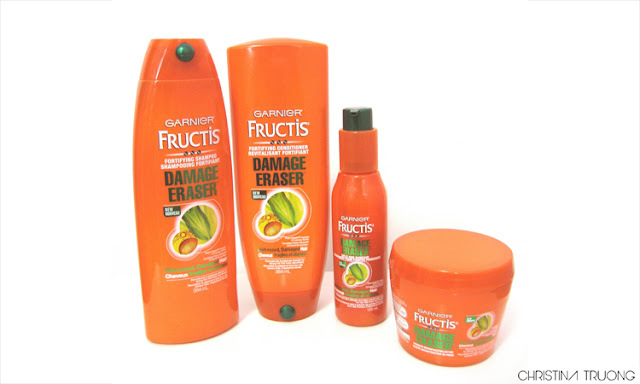 This is the new Garnier Fructis Damage Eraser. It was a bit of a shocker for me since all I did was a process of elimination, while many mentioned it was coming from a "higher end" drug store brand. There were times where I wanted to make the switch and change my guess. But I stuck to it even though I was a minority. And I am glad I did! What were your thoughts after the big reveal? I very much enjoyed the products. Even though there was no "wow" factor, it still works nicely. I look forward to trying the Strength Reconstructing Butter!